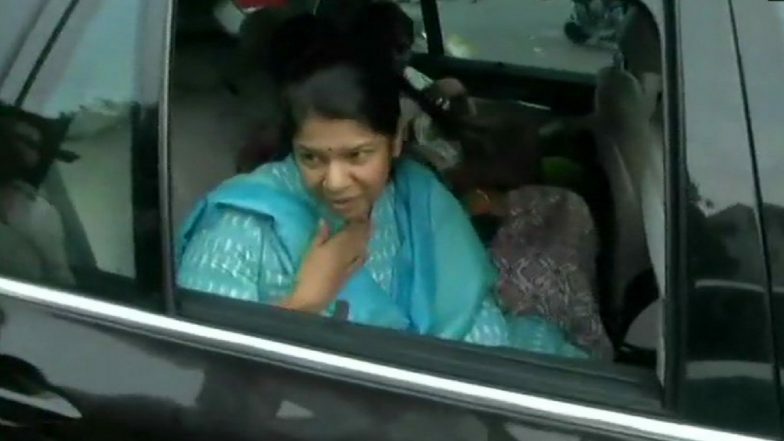 Thoothukudi, April 16: The income tax department on Tuesday evening raided the house of Dravida Munnetra Kazhagam (DMK) leader Kanimozhi in Tamil Nadu’s Thoothukudi. Kanimozhi is the DMK’s candidate from Thoothukudi parliamentary seat in the Lok Sabha elections. The IT officials along with Election Commission personnel visited her house to verify allegations that "lots of cash was stashed on the first floor of the house". Vellore Lok Sabha Elections Cancelled After Cash Seizures From DMK Candidate's Office. “The Election Commission is playing a sick joke on the people of Tamil Nadu,” DMK spokesperson A Saravanan told NDTV. The raids were conducted at Kanimozhi’s house in Kurinji Nagar area of Thoothukudi. Kanimozhi, sister of DMK chief MK Stalin, is the DMK candidate for the Thoothukudi seat. After the news spread like a storm, DMK workers protested outside the leader's home against IT officials. The visuals from Kanimozi's house was shared by news agency ANI. In the visuals, IT and EC officials can be seen inspecting the house. On Tuesday, the Election Commission cancelled the elections in Vellore after a huge case was recovered from the premises of DMK candidate Kathir Anand. Elections in Tamil Nadu's 39 Lok Sabha seats and 18 assembly seats will be held in the second phase on Thursday.